When I saw Cheah of No Frills Recipes posted her Country Style Steam Chicken, I just remember I cooked this similar dish many months ago. I don’t know why I did not post the recipe until now …. sigh … getting more forgetful nowadays. This Country Style Steam Chicken is one of my favourite dishes that I always eat with extra rice when my grandma cooked this for us when I was a little girl. 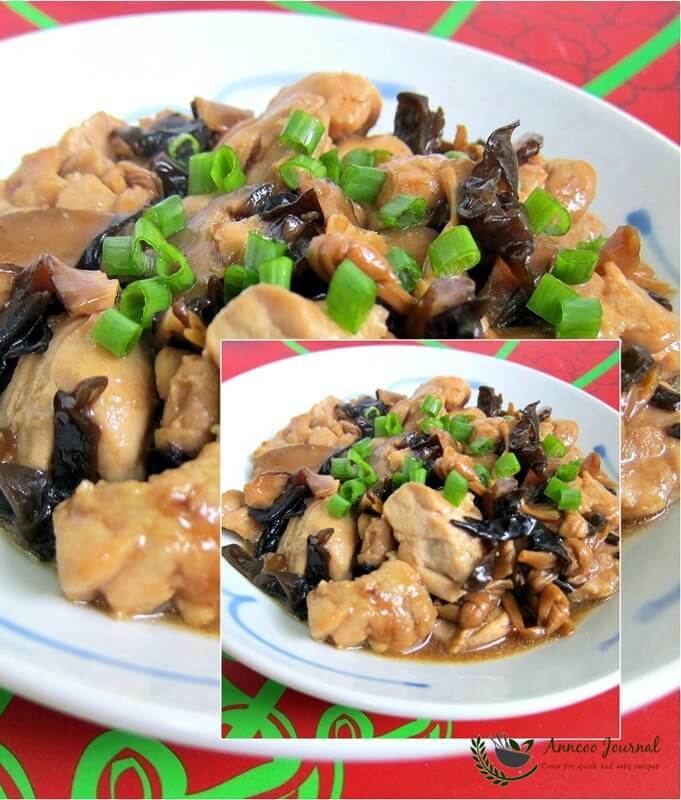 It is a simple and delicious dish with the mixing of shredded cloud ears, sliced mushrooms, golden needle vegetable and bite sized chicken. Marinate the above for few hours or overnight. Fry (B) ~ Heat wok with some oil, fry ginger and garlic for a while and add in shredded cloud ear, golden needle vegetable and sliced mushrooms, stir fry ingredients well. Lower heat and pour in seasoning sauce, mix well and off heat leave ingredients to cool. Mix well (A) marinated chicken meat together with the (B) ingredients in a corningware square dish or large plate. Cover corningware square dish with aluminium foil and steam at high heat for 30 minutes. (covering with aluminium foil is to prevent water from getting into the chicken meat during steaming). **stir the chicken meat with a spoon after 15 minutes of steaming and continue to steam for another 15 minutes or till chicken meat is cooked. Sprinkle some chopped spring onion when serve. 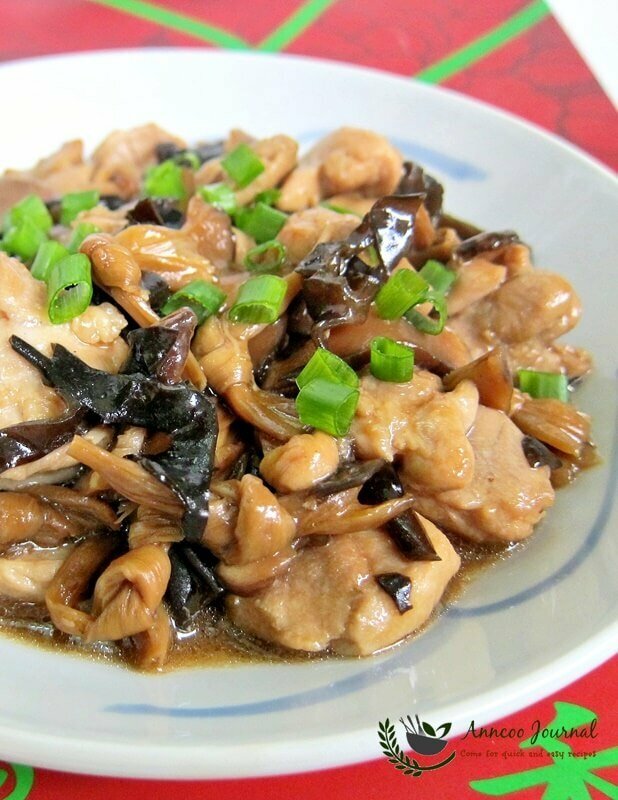 Cloud ear or Wood ear (mu er 木耳) is an edible fungus used primarily in Asian cuisine. This is sold dried and need to be soaked before use. While almost tasteless, it is prized for its slightly crunchy texture. Golden needle vegetable (gum jum 金针in Cantonese) is actually daylily refer to Wiki. You can also read more details from Taste HongKong. Thanks LeQuan. So nice to hear from you again. This dish looks very wholesome and delicious, Ann. 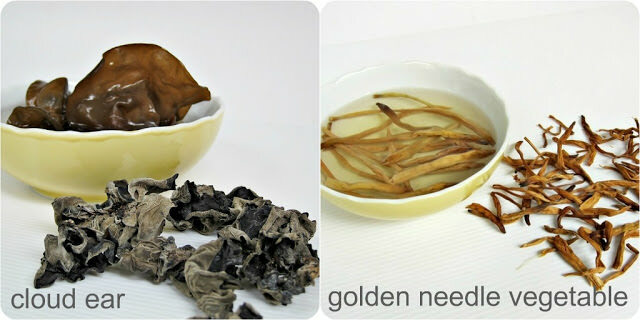 I love golden needle vegetables, but unfortunately they are not found in many dishes. Another great recipe! Thank you for sharing. Msihua, hahaa…I thought this is a Cantonese dish. Anyway is delicious dish that most Chinese enjoy it. Beautiful photos and this looks divine! Just the right dish that I like to eat now! Hungry and cold here. Goes well with a bowl of piping hot rice..
My favorite steamed chicken dish. Yum! Maravillosa receta luce espectacular,me encanta,hugs,hugs. This looks very much like a Hakka dish 🙂 Yayy for more traditional recipes! delicious and a stunning series of photos. I have such a hard time making brown food look good! You nailed it! Thanks Chris, have a try. You'll love it! Bobo, Zoe ~ Right this is a very comforting dish. Sonia & Cheah, Thank you for your compliment. Yes I just got a new canon camera recently. Indu, did you try the Asian market? Tze, I think this is a Cantonese dish that my grandma always cook for us last time. Shirely, so nice you're back to blogging after the tired trip. Of course I want to see more of your pics in Finland. My mom used to make something similar to this. Thanks for the reminder Ann. I might cook this today if I can find all the ingredients. Thanks for sharing. yum!! a truly chinese dish, i love that!! Wow, looks really juicy delicious. lol! Slurp…. I have never seen the golden needle vegetables, so interesting and so much to learn! Hey Ann, thks so much for visiting my blog during my absence! I'm feeling hungry now especially after seeing this dish. I've cooking chicken with fungus too. Yum! I'd so much fun in Helsinki! Wish u'd joined the contest too 🙂 Remember to look out for more pix!! Ann, your dish looks very appealing, yes, will need more rice to mop up the gravy too! Your clicks are so sharp and clear! New camera? What I love about this is how tender that chicken must be! My MIL once cooked this dish, I know this is a yummy home cooked dish! I have so long did not cook this dish, only keep trying new recipe, hehehe! Thanks for remind me and I must cook this soon. You bought a new camera? your photo look very sharp and clear. Mouth watering…Sadly cloud ear and golden needle vegetable are not available in my area. I like this simple yet delicious and nutritious dish. I need extra serving of rice too! This looks like such a comforting dish! I love these recipes that remind us of family and good memories of our childhood! This is what I called "traditional home-style cooking" …very nice! hmm.. i love this dish too.. yup.. i will love the gravy with rice..yums..